We have received 50 reviews of Welcome to Nowhere . You can add a review or scroll down to read reviews. To send in your review of Welcome to Nowhere , please fill in the info below and click the button labelled Send Review Now. Reviews will be checked by our team before they appear on the website. Your last name will not appear on the site, but we need to know who you are in case you win a prize! 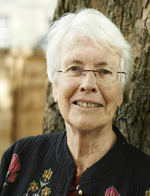 Born in New Zealand in 1943 to parents of Scottish heritage, Elizabeth Laird moved to South London in 1945. She studied French and German at Bristol University before deciding to travel the world. From teaching in Malaysia and Ethiopia, to living in Iraq and being evacuated from Beirut during the civil war, Elizabeth lived a life full of adventure before deciding to become a writer. Her books are deeply influenced by her travels and experiences of other cultures; she was inspired to write Welcome to Nowhere after spending a couple of weeks in refugee camps near the Syrian border. She tells herself that she’s now too old for big adventures, but knows that if she gets some mad inspiration she’ll be off again as soon as she can pack a bag! Before long, bombs are falling, people are dying, and Omar and his family have no choice but to flee their home with only what they can carry. Yet no matter how far they run, the shadow of war follows them - until they have no other choice than to attempt the dangerous journey to escape their homeland altogether. Where do you go when you can't go home? While living and working in Ethiopia, Elizabeth was a disc jockey on a late night music show, broadcasting to Africa and India. She met her husband, David McDowall, on a plane in India where he was extremely kind to her while she was feeling airsick. She’s won the Carnegie Medal five times and is well known for stories like The Fastest Boy in the World, The Garbage King and Oranges in No Man's Land. Her books have been translated into 15 languages. This book gave a really believable insight into how the war in Syria began. It was hugely enjoyable and it was a real eye-opener. I recommend this book to anyone who loves a good book. marlie gave Welcome to Nowhere 5 out of 5 and now plans to read Girls Can't Hit by T S Easton. jason gave Welcome to Nowhere 2 out of 5 and now plans to read Girls Can't Hit by T S Easton. Ellis gave Welcome to Nowhere 4 out of 5 and now plans to read Girls Can't Hit by T S Easton. 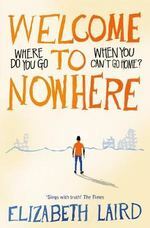 Welcome to Nowhere is an ambitious book that attempts to tell a story of a family in Syria with no home. Even though the writer had spent time with refugees the story felt slow and the use of English colloquialisms like, 'bloke' and didn't flow with the setting. In my opinion the notes at the end of the book are more interesting the story as a whole. It felt rushed and at points where, Omar, one of the main characters says things to people that seem like cliché scenes from a super hero movie. This book has taught me not to judge a book by its cover. I admit parts of the book made sense but the book felt slow and bland and in general It felt like the book could have unintentionally mislead people who read it. I did not enjoy this book but I hope that maybe the writer might write another version in the future, based off her experiences with a better story and more research. William gave Welcome to Nowhere 2 out of 5 and now plans to read Ink by Alice Broadway. This was a good story because it told me about a situation I previously didn't understand. Sam gave Welcome to Nowhere 4 out of 5 and now plans to read The Extraordinary Colours of Auden Dare by Zillah Bethell. I really disliked this book. it wasn't interesting and the characters backstories weren't explained in much detail. Jacob gave Welcome to Nowhere 1 out of 5 and now plans to read Dragon's Green by Scarlett Thomas. "Welcome to Nowhere" was brilliantly written and is something for Elizabeth to be extremely proud of, however I'd only give it a three as I didn't ,personally, enjoy it as much as some of the other books in the shortlist. It gave me an idea of the conditions and losses people in Syria had to and are still having to face which I think is important. Kaitlyn gave Welcome to Nowhere 3 out of 5 and now plans to read Girls Can't Hit by T S Easton. This book is educational on serious real life topics that are beneficial to know more about, but is still funny and easy to read. For example, Omar explains how the bombings and shootings affected him and his family and their struggle to find a place to call home, but there are still amusing. relatable moments. I enjoy the fact that it was left on a cliffhanger so you can decide what happens next in Omar's life. Tara gave Welcome to Nowhere 5 out of 5 and now plans to read Dragon's Green by Scarlett Thomas. At worst it was slow and endless with no reason to continue like a fat gerbil on a rusty exercise wheel, never going anywhere never going to stop trying. At least its not a terrible concept, for example if you read the book as a short summery the first half is almost great. The problem is the details are slow and drawn out as some rivalry's that you'd think would last for a long time last for two chapters. At best in another case the main characters randomly move house at the beginning when they could have started in the second house for all any story driven reader cares. There are upsides to this book, few and far between, but there nonetheless these being bits where people die or are presumed dead as they add more interesting ways to pull the family apart. The other best bit is where the protagonist finds some interesting characters that could have been an interesting story device but they were dragged away by the plot never to be seen again until the ending few chapters. I don’t understand how this book got on an awards list but maybe someone enjoyed it, in the distant universe ,just maybe. Oliver gave Welcome to Nowhere 1 out of 5 and now plans to read Dragon's Green by Scarlett Thomas. Welcome to nowhere is an amazing book full of excitement, fright and real life problems. I was shocked to here that this kind of thing was happening around this world! I now feel extremely sorry for everyone going through that horror. There is no way in my opinion that this is OK. My favourite character has to be Ma because of all the struggle she has gone through and to loose a family member I can't believe what that would feel like. But Ma stayed strong and independent. This book was different to what I'm used to and it really opened my eyes to all these terrible things happening. Evan gave Welcome to Nowhere 4 out of 5 and now plans to read The Extraordinary Colours of Auden Dare by Zillah Bethell. I really enjoyed this book because it helped me learn more about something I didn't really know that much about. I thought that the characters were really interesting. Eman was probably my favourite character because she always stood up for what she believed in. Emily gave Welcome to Nowhere 3 out of 5 and now plans to read Dragon's Green by Scarlett Thomas. Adaugo gave Welcome to Nowhere 5 out of 5 and now plans to read Girls Can't Hit by T S Easton. This book is about a family from Syria coping with and escaping the war that's happening. The book is in first person and is told by Omar, a child in the family who always seems to get the short end of the stick. I don't think this book deserves all the hate its getting as I actually think this boom has a strong plot with interesting characters. My main complaint however is how at the end off the story Omar's younger sister gets ill and we are expected to care. I believe the author should have developed her character more or made a different character such as Musa to make it more meaningful to the reader. Overall this is a strong, good book with a not so good ending. Alfie gave Welcome to Nowhere 4 out of 5 and now plans to read I Have No Secrets by Penny Joelson. I absolutely loved this book! It was very moving and touching as it was about the Syrian war that is still happening today. There were many parts of the story that were very emotional: like Omar's dad suddenly dying and his sister being diagnosed with a heart problem. Overall i thought this book was the best i have ever read and i really recommend to everyone. Malaika gave Welcome to Nowhere 5 out of 5 and now plans to read The Extraordinary Colours of Auden Dare by Zillah Bethell. it was much better than i expected but it was really hooking and thrilling. i loved this book and would love to read a sequel if there will be one. qianye gave Welcome to Nowhere 5 out of 5 and now plans to read Girls Can't Hit by T S Easton. I thought the book was quite interesting but also a bit boring because it was all about one family and there wasn't much excitement in the book. I liked the part when he has to hide the phone and the laptop away from all the army people so they didn't find any evidence. Jodie gave Welcome to Nowhere 3 out of 5 and now plans to read Girls Can't Hit by T S Easton. This book could be so much better and I expected more from it. The author try's to add too many things and it becomes not as realistic as it could be. This book builds up for a great ending but ends up ending quite predictable and I saw the ending happening from about 1/3 through the book. The best aspect of this book is that it explains lots about refuge camps and gives a insight of what it would be like to be a refugee. Bob gave Welcome to Nowhere 3 out of 5 and now plans to read I Have No Secrets by Penny Joelson. Jake gave Welcome to Nowhere 3 out of 5 and now plans to read I Have No Secrets by Penny Joelson. I loved this book. It really makes you think about what is happening now, Towards the end it was especially good, as it was both happy and kind of scary. Brianna gave Welcome to Nowhere 5 out of 5 and now plans to read Ink by Alice Broadway. This was a moving story about one family's experience of life in Syria and the turmoil they face when they are forced to flee their home in Bosra. I couldn't put it down and I think it will give our students an interesting insight into the experiences of refugees. Miss Burns gave Welcome to Nowhere 5 out of 5 and now plans to read Ink by Alice Broadway. Ordinary boy? He believed so, until cause after cause shed itself like unworthy snake ready to pounce and sink its unbearable teeth sink into you. He thought himself as someone who never took the chance or even snatched the risk. This was until utter war broke out. Before the war he had had a quite easy life no matter how much he thought it was hard. He got up in the morning at half past four to work a job with his Uncle Ali, he was a nice man however didn’t like to show it. Once though he found it very peculiar when a man, Mr Nosy, walked in and said something to Uncle. He didn’t respond like he would usually, like it was a threat. He forgot about by the time they got to school though. After his day at school he would rush home, eat his dinner, and then head off to work at his cousin Rasoul’s. He loved to work there, He dreamed of being a business man, even bigger than Rasoul’s. Suddenly his dreams faded away when everything in his life turned to chaos. When he moved to Daraa he didn’t quite belong, like the wrong pieces in a jigsaw however Musa (his brother with cerebral palsy) someone found friends very easily. This struck Omar like a Clap of lightening. In the end they turned out to be bad news like Omar had predicted. Eventually they moved to his aunty Fawzia’s farm in the countryside, where he met his cousin called Jaber. Jaber pulled tricks on him like when Omar was on the donkey and he popped a firecracker behind the donkey and the donkey sped off like the flash and through Omar in to the Cistern. I would highly recommend this book due to the engagement and the detail knitten into the plot. AMAZING! Natasha gave Welcome to Nowhere 5 out of 5 and now plans to read Dragon's Green by Scarlett Thomas. Poppy gave Welcome to Nowhere 4 out of 5 and now plans to read Dragon's Green by Scarlett Thomas. I found the book very predictable and a little boring. Madeleine Beth gave Welcome to Nowhere 2 out of 5 and now plans to read The Extraordinary Colours of Auden Dare by Zillah Bethell. I thought this book was an eye opener to what’s going on around the world telling you an overview of what’s it might be like to be in the middle of a war in Syria. It an emotional rollercoaster of ups and downs. Katie gave Welcome to Nowhere 5 out of 5 and now plans to read Ink by Alice Broadway. This book is amazing. I feel that it really captures the life a Syrian family. I was laughing and crying along with them, as they journeyed through the horrors of the civil war. The author actually visited several refugee camps and therefore the book is even more emotional as it includes the aspects of a real refugee’s life. By the end of the book, I really cared about all of the characters and would love there to be a sequel about how Omar finds life in Britain. Emily gave Welcome to Nowhere 5 out of 5 and now plans to read The Extraordinary Colours of Auden Dare by Zillah Bethell. Imagine a world where you`re constantly afraid of being bombed. That`s where Omar and his family live, Syria at a time of civil war, the government fighting against civilians. Omar and his family flee to Jordan hoping for a better life, but will Musa`s secret of who he`s been mixing with being revealed. This is a story of how war can break a family apart. This story was extremely touching and made me quite emotional in some places. It shows the struggles refugees face and how we should do our best to help them. I was on the brink of tears in most places and actually cried in some. This is the one book EVERYONE should read at least once. It really brings close to home the reality of war and how people are actually dying. Helen gave Welcome to Nowhere 5 out of 5 and now plans to read Girls Can't Hit by T S Easton. I found this book very thought provoking as, to someone who doesn't know about the Syria crisis, this could be perceived as fantasy and the awful things could just be fiction. However, all the things that happen are perfect examples of what is happening right now. To me, the characters seemed very real and I could get a good mental picture on them and their personalities. I found it a gripping read and would recommend. Jem gave Welcome to Nowhere 5 out of 5 and now plans to read The Extraordinary Colours of Auden Dare by Zillah Bethell. This is an amazing book. One of my favourites so far. It is extremely emotionally gripping and shows how lucky we are to have a roof over our heads. It has many ups and downs throughout the book and the story finishes on a cliffhanger and I would really like there to be a sequel to it. Emily G gave Welcome to Nowhere 5 out of 5 and now plans to read Dragon's Green by Scarlett Thomas. I quite like this book and for me it kept me thinking about what was going to happen. I would recommend this. Bethany gave Welcome to Nowhere 3 out of 5 and now plans to read Dragon's Green by Scarlett Thomas. This book was gripping and highlighted the issues in this event. I think that it helps teens and people who perhaps don't really understand what went on but it shows it from someones point of view who is a similar age to the readers and helps them understand the importance of what went on. Harriet gave Welcome to Nowhere 4 out of 5 and now plans to read Girls Can't Hit by T S Easton. It was a very good book.I really liked the story and I liked that it had an emotional roller coaster. Maria gave Welcome to Nowhere 4 out of 5 and now plans to read Dragon's Green by Scarlett Thomas. It was definitely a gripping and exciting read. However, I feel that the ending didnâ€™t fit the theme of the book and when I put it down for the final time, it seemed strange, as if the book needed to continue. That particular theme of book, I believe, needs a more conclusive and flat ending. Saif gave Welcome to Nowhere 4 out of 5 and now plans to read The Extraordinary Colours of Auden Dare by Zillah Bethell. Welcome to Nowhere is a developing tale that always has something unexpected around the corner. You think the family's situation is getting better the suddenly the whole story twists again. The connection to the characters is great as they all have extremely different personalities, Omar is extremely developed and similar to me, I could imagine being in his situation and felling the things he feels. Ben gave Welcome to Nowhere 5 out of 5 and now plans to read I Have No Secrets by Penny Joelson. Welcome to nowhere really touched me emotionally. I felt as if I was their with Omar and his family and as if I was with them through their struggles. The detail and accuracy about what happend in Syria with the civil war and how the author managed to capture it in to a story format to make us younger generations aware of the crisis really makes me proud to have read this amazing book. I hope that the author continues to set an example to us all. Charlie gave Welcome to Nowhere 5 out of 5 and now plans to read Girls Can't Hit by T S Easton. welcome to nowhere is an extraordinary tale which seems like your there in the war as part as the family and it couldn't be more eye opening. I like how the author has weaved everything in so you wouldn't expect it. It is amazing and i would recommend it to anyone looking for a good read. natasha gave Welcome to Nowhere 5 out of 5 and now plans to read The Extraordinary Colours of Auden Dare by Zillah Bethell. Although this type of story is not one I'd usually reach for or enjoy, I understand the importance of this being told as it tackles relevant issues of modern day. I however really didn't find it enjoyable, but if you appreciate real life emotional reads I guess this is for you??? Martha gave Welcome to Nowhere 3 out of 5 and now plans to read I Have No Secrets by Penny Joelson. It was exiting and gripping - I couldnâ€™t put it down! The fact that this has happened to people makes it seem more real and is also very informative. The ending was quite unsatisfactory, I had expected more from it. Alice gave Welcome to Nowhere 4 out of 5 and now plans to read The Extraordinary Colours of Auden Dare by Zillah Bethell. A beautiful insite into a lifestyle not talked about enough in our current society. The book showed a life that is so real for so many people through false characters and I think that is what made it even better, the fact that the author can make the reader think so much about the events happening right now in a country that is only a five hour plane ride away is amazing. I thought the book gave insights into many situations of people who are in the middle of war. Hannah gave Welcome to Nowhere 5 out of 5 and now plans to read Dragon's Green by Scarlett Thomas. It was a very good book. Ii was an emotional book. It had a very passionate message. Anna gave Welcome to Nowhere 4 out of 5 and now plans to read I Have No Secrets by Penny Joelson. Welcome to Nowhere is an unusual book with a sense of debate within politics. I felt my favourite character was Musa as I felt the most sympathy but awe towards him as he continued to be positive throughout the story. This book had a slower start and you had to truly get into the storyline to appreciate it however I could clearly picture the characters and it gave me a new insight into Syria (especially through the character Riad) and refugee camps. A page-turner I didn't want to end. Maddie gave Welcome to Nowhere 5 out of 5 and now plans to read Ink by Alice Broadway. I liked this book because it helped me understand more about refugees and how they have to leave everything behind. It was very powerful and inspiring. However the story did take a while to get interesting but after that point I was hooked. Zach gave Welcome to Nowhere 4 out of 5 and now plans to read I Have No Secrets by Penny Joelson. Anna gave Welcome to Nowhere 4 out of 5 and now plans to read The Extraordinary Colours of Auden Dare by Zillah Bethell. Danny gave Welcome to Nowhere 5 out of 5 and now plans to read Dragon's Green by Scarlett Thomas. It was an extremely inspiring story, I loved how the book was based on the truth, the story technically describes what happens in today's society. Also, it was very delightful to see that a young boy has so many dreams and ambitions and how he works towards achieving them. I DEFINITELY recommend it. Atena gave Welcome to Nowhere 5 out of 5 and now plans to read The Extraordinary Colours of Auden Dare by Zillah Bethell. I think this book is amazing because it is based on real life events .the writer uses a lot of realistic events and creates tension in many scenes. The first paragraph got me hooked and I could not stop reading.It even stopped me from going on my phone! The writer uses a lot of description and keeps the reader thinking without giving too much away. It also gives examples of what life is like for refugees which I think is really important for the reader to not only enjoy the book but learn something from it. I thoroughly enjoyed this book and I am definitely putting this into my top three books to vote for! Zoya gave Welcome to Nowhere 5 out of 5 and now plans to read I Have No Secrets by Penny Joelson. Thank you Elizabeth Laird. I really love this book and I can't stop reading it. This is a book about a war going on in Syria and the main character is called Omar. He has two sisters and brothers and he lives in a city called Bosra. One day, lots of people are killed. he is really determined to find peace. His family can't travel on an aeroplane because the government blocked all the electricity. Will he survive of die? Do you think he will find peace? Isma gave Welcome to Nowhere 5 out of 5 and now plans to read Dragon's Green by Scarlett Thomas. Alasdair gave Welcome to Nowhere 4 out of 5 and now plans to read I Have No Secrets by Penny Joelson. I believe that about 1/2 into he book I genuinely started to enjoy reading but up until that point I didn't. The pacing was rather slow and the same things seemed to be happening. However I believe when the protests began happening the story was much more exciting. It was an accurate portrayal of the Arab Spring. I also have a bit of a knit pick about the book. Why are they speaking English. It could be said that they learnt English but why would you remember everything you said as a child when you learn the language as Omar is not described as intelligent. Samuel gave Welcome to Nowhere 2 out of 5 and now plans to read The Extraordinary Colours of Auden Dare by Zillah Bethell. I was really looking forward to reading this book! I had already read a book by Elizabeth Laird (Crusades) and found it great, so I read this and I can honestly say it's one of the best books I have read. It's probably one of the most intense as well! every bit got me into it and I now know what some people go through in Syria. I love how accurate she writes the Arabic (because I know how to speak some) and the way they lived, which actually shows she has put effort into researching the way they live! I love this book so much! Keep up the good work Elizabeth! Deia gave Welcome to Nowhere 5 out of 5 and now plans to read Girls Can't Hit by T S Easton. 'Welcome to Nowhere' really highlights the suffering due to the civil war in Syria. This gritty book takes you through a family's journey as they flee their home in Bosra forced to become refugees in a camp across the border in Jordan. It really highlights the harsh reality of life in Syria. I'm sure my students will find this book very moving and insightful. Miss Busby gave Welcome to Nowhere 5 out of 5 and now plans to read Girls Can't Hit by T S Easton.